Walther CPA Newsletter June 2018 – Walther Partners Inc. The IRS issued the calendar year 2019 inflation-adjusted figures for the annual contribution limits for health savings accounts (HSAs) and the minimum deductible amounts and maximum out-of-pocket expense amounts for high-deductible health plans. There is little difference in people, but that little difference makes a big difference. That little difference is attitude. The big difference is whether it is positive or negative. Sec. 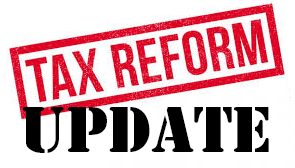 199A allows taxpayers other than corporations a deduction of 20% of qualified business income earned in a qualified trade or business, subject to certain limitations. The deduction is limited to the greater of (1) 50% of the W-2 wages with respect to the trade or business, or (2) the sum of 25% of the W-2 wages, plus 2.5% of the unadjusted basis immediately after acquisition of all qualified property (generally, tangible property subject to depreciation under Sec. 167). The deduction also may not exceed (1) taxable income for the year over (2) net capital gain plus aggregate qualified cooperative dividends. Qualified trades and businesses include all trades and businesses except the trade or business of performing services as an employee and “specified service” trades or businesses: those involving the performance of services in law, accounting, financial services, and several other enumerated fields, or where the business’s principal asset is the reputation or skill of one or more owners or employees. 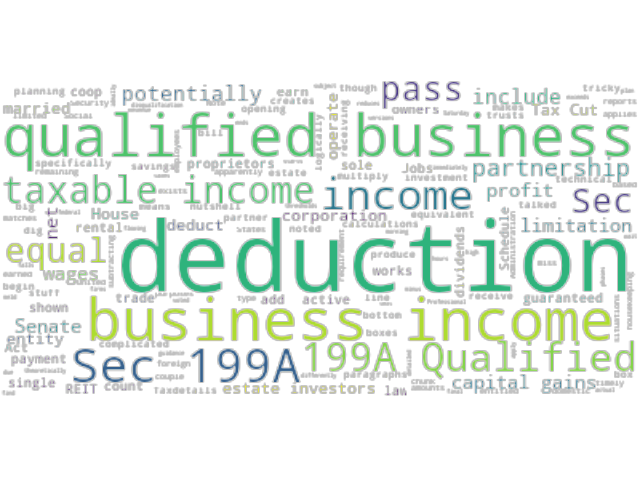 Qualified business income is the net amount of qualified items of income, gain, deduction, and loss with respect to a qualified trade or business that are effectively connected with the conduct of a business in the United States. 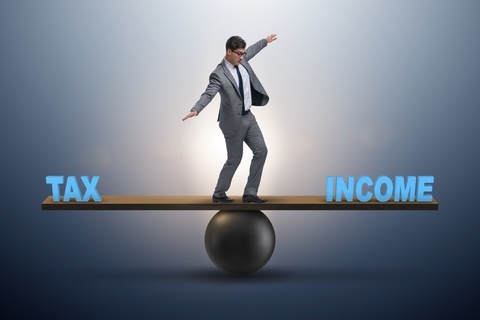 However, some types of income, including certain investment-related income, reasonable compensation paid to the taxpayer for services to the trade or business, and guaranteed payments, are excluded from qualified business income. The W-2 wage limitation does not apply to taxpayers with taxable income of less than $157,500 for the year ($315,000 for married filing jointly) and is phased in for taxpayers with taxable income above those thresholds. Income from specified service businesses is not excluded from qualified business income for taxpayers with taxable income under the same threshold amounts. The new law also reduces the threshold at which an understatement of tax is substantial for purposes of the accuracy-related penalty under Sec. 6662 for any return claiming the deduction, from the generally applicable lesser of 10% of tax required to be shown on the return or $5,000 before the new law, to 5% of tax required to be shown on the return or $5,000. The law’s many yet-unclear points include its application to rental property, the netting of qualified business income and loss for taxpayers with multiple qualified trades or businesses, determining the deduction for tiered entities, allocating W-2 wages among businesses, and whether compensation paid to an S corporation shareholder is included in W-2 wages for purposes of that limitation. Rate reduction and thresholds: The law provides, for tax years 2018 through 2025, a new table under Sec. 1(j)(2)(E) of ordinary income tax rates and thresholds for trusts and estates (subject to adjustment for inflation for years after 2018) as shown in the chart below. The law retains the preferential rates for qualified dividend and long-term capital gain income under Sec. 1(j)(5) but adjusts the thresholds as illustrated in the chart below. Sec. 164, state and local taxes: The law amends Sec. 164(b) to limit the aggregate deduction for state and local real property taxes, state and local personal property taxes, and state and local income taxes to a maximum of $10,000 per year. This limitation does not apply to any real property taxes or personal property taxes incurred by a trust or estate in carrying on a trade or business, or an activity under Sec. 212. Sec. 67, miscellaneous itemized deductions: The law amends Sec. 67 by suspending all miscellaneous itemized deductions. Trusts and estates will not be permitted to deduct investment fees and expenses and unreimbursed business expenses, among others. On its face, the law does not appear to impact Sec. 67(e), which does not apply the 2% limitation to administration expenses incurred solely because the property is held in a trust or estate (i.e., trustee fees); however, this is an area where clarification will be required. Sec. 642(b), personal exemptions: The law amends Sec. 151 to suspend the personal exemptions for individuals; however, trusts and estates remain entitled to their personal exemptions under Sec. 642(b). The amounts of the personal exemptions for trusts and estates remain unchanged. Alternative minimum tax (AMT) — Sec. 55: The law did not amend the AMT for trusts and estates. The exemption of $24,600 and phaseout threshold of $82,050 for trusts and estates (for 2018) were not changed. These amounts will continue to be adjusted for inflation under Sec. 55(d)(3). Income distribution deduction (IDD) under Sec. 651: Under Sec. 651(b), simple trusts are entitled to an IDD, which is limited to the lesser of fiduciary accounting income (FAI) or distributable net income (DNI). In the past, FAI has generally been greater than DNI for simple trusts, so the IDD for simple trusts usually equals DNI. This is because all expenses were allowed in calculating DNI, while some expenses were allocated to principal when calculating FAI. As trusts and estates lose the deductions discussed above, the adjusted total income (ATI) will increase. As ATI increases, DNI increases. FAI will remain the same, as the allocation of expenses for FAI is controlled by a trust’s governing document or the applicable state’s Principal and Income Act. As such, this may result in FAI becoming the more common IDD limitation, which may result in trusts and estates paying more income tax at the trust level than before the Tax Cuts and Jobs Act was enacted.